Evidence of a growing slowdown in the Eurozone economies continues to show up across the board. German retail sales, for example, fell for the third consecutive month in December according to the Bloomberg purchasing managers retail sales index released at the end of December. The index came in at a seasonally adjusted value of 44, compared with 43.6 in November. A reading below 50 indicates contraction. Retail sales across the entire 13 nations euro bloc also declined in December. In Spain the evidence for a sharp slowdown is quite general now, and only in France does the economy continue to show some level of resistance to the downward march. Euro zone purchasing managers surveys for the manufacturing sector also tend to confirm the idea that the economy of most member states has slowed in the fourth quarter despite what seem to be pockets of resistance in some countries. 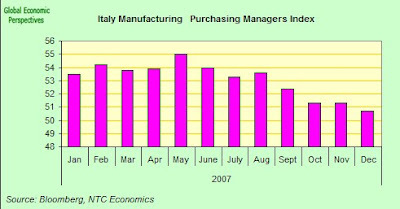 The purchasing managers index for the euro zone manufacturing sector eased to a final 52.6 in December from 52.8 in November. The manufacturing PMI for the whole zone has managed to remain above the October low of 51.5, but the December reading is still the second weakest figure since Aug 2005.The German PMI eased slightly but held up better than expected, slipping to 53.6 from 53.7 against market expectations for a decline to 53.2. Italian retail sales declined for a 10th successive month in December as a bleaker economic outlook damped consumer demand during what should have been the busiest shopping period of the year. The seasonally adjusted purchasing managers index of retail sales dropped to 44.7 from 45.3 in November. 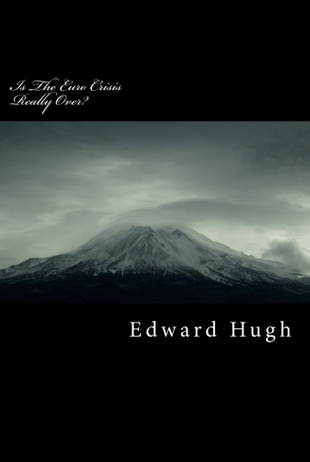 The reading has now been below 50, the level that signals a contraction in sales, since February. Even record low unemployment of 7.2 percent has failed to spur purchases, prompting retailers to expect lower sales next month. The Italian manufacturing PMI also fell more than expected, declining to 50.7 from 51.3 (a level at which industry is just expanding, but only just), compared with expectations for a decline to 51.0. This meant the index was at its lowest level for more than two years. Italian consumer confidence continues to trawl the bottom, falling to a four-month low in December as signs that economic growth is slowing prompted households to cut back on spending. The Rome-based Isae Institute's index, based on a survey of 2,000 families, fell to 107 from 107.6 last month. And Italian business confidence declined to a two-year low in December after a strike by lorry driver disrupted production and as manufacturers brace themselves for the likelihood of slower growth. The Isae Institute's business confidence index fell to 91.8 from a revised 92.1 in November, the Rome-based research center reported today. That is the lowest since December 2005, when the index reached 91.5. 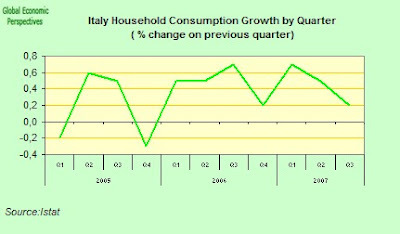 The pace of increase in Italian household spending - long a soft point in Italy's less than stellar performance even though it accounts for nearly two-thirds of Italy's economy - continues to decelerate, only growing by 0.2 percent in the third quarter when compared with the second, down from the 0.5 percent rise achieved in the second quarter, and the 0.7% q-o-q rate achieved in the first quarter. Household spending won't be helped any by Italy's inflation rate, which jumped in December to the highest level in more than four years as record oil prices pushed up the cost of petrol and transportation. Consumer prices gained 2.8 percent from a year earlier, as calculated by European Union methods, the Rome-based national statistics office said. That's highest rate of increase since November 2003. Italian GDP growth seems to have peaked back in the 70s (or maybe earlier, since I don't have data for the pre 1970 period), and indeed since 1990 Italian GDP growth has only managed an average of something like 1.4% growth per annum. 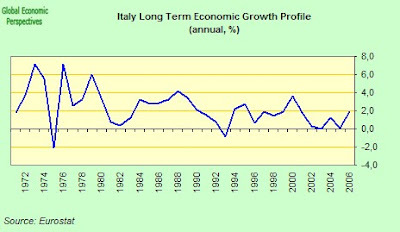 As can be seen from the chart the rate of growth has been, if anything, even lower since 2001, and there is no good reason to believe that this underlying tendency has been reversed, indeed there are strobg theoretical reasons for anticipating quite the contrary, as Italy ages. 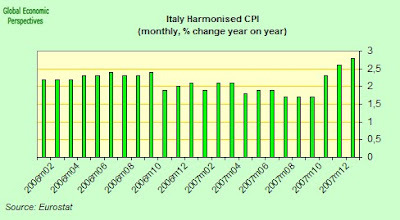 2008 Forecasts: The OECD in December revised their 2007 Italian forecast down to 1.8%, and the 2008 one down to 1.3%. Confindustria also revised their forecast down in December, arguing that growth would slow to 1 percent in 2008 from an 1.8 percent this year, citing factors like the rising cost of food and oil and the rise of the euro against the dollar. Such numbers are clearly not encouraging, but arguably downside risk for 2008 is greater even than either the OECD or the Confindustria forecasts reflect Morgan Stanley's Vladimir Pillona is somewhat more sanguine. While presenting the MS central forceast for Italian economic growth to slow to 1.0%Y in 2008, from 1.8%Y in 2007, he goes on to note that "even annual GDP growth of 0.5%Y next year has a significant possibility of occurring, as shown by our model’s forecast error bands". I personally will be very surprised if we still see calendar year 2007 anyhting like as high as 1.8%, but more to the point even 1.3% may be rather on the high side if we get a significant deterioration in the external environment, especially in Eastern Europe on which Italy is fairly dependent, and where the Italian banking sector has significant exposure. So that puts me much nearer to Pillona's "basement bargain" number of 0.5% than to any of the others. One of the reasons for my pessimism relates to my assessment of Italy's current trend growth rate, and to the level of fiscal and monetary tightening which may be operating on the economy even as it slows. During 2007 the Italian govenment has been running a fiscal deficit of comfortably below the 3% of GDP required by the EU commission. But since this fortunate situation was in part acheieved by the use of one off measures, and in part by the strong tax inflow from the above trend growth, the government will need to maintain a comparatively tight fiscal stance to keep things on course, and any attempt to further loosen may run into real problems with the EU commission and the credit rating agencies. And as I keep arguing, it is very hard to see an accomodative monetary posture from the ECB in the near future. The IMF in their October World Economic Outlook came in with a similar figure of 1.3% for 2008, the Economist Intelligence Unit is forecasting 1.7% in 2007 and 1.4 in 2008, and the latter 2008 figure was also endorsed by the EU commission in its November forecast. As I indicate, my own view is well to the downside of all this. 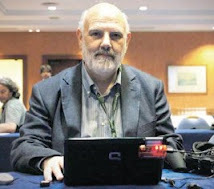 The only apparent bright spot on the horizon is employment, but I am dubious that in the context of Italy's ageing workforce this will work through as some are hoping, as I expain at some considerable length in this post here. My opinion is that Italy will enter recession at some point during 2008, and that we may well have 2 consecutive quarters of negative growth. The continuing high euro will maintain pressure on Italian exports, and high oil and food prices will maintain pressure on the inflation front, at least in the firts half of 2008. At the same time, and despite rumours that Romano Prodi's government is compemplating a large tax cutting package, I anticipate that the fiscal environment will remain tight. Italy's large (106% GDP) accumulated debt, and the vigilance from the gentlmen at Standard and Poor's and the other credit rating agencies more or less guarantee that. As most of the forecasts suggest, we have been seeing growth which is somewhat above trend during the upswing in the last couple of years, so it would not be surprising if we now saw some below trend growth. Trend growth (over a 5 year average) in Italy may even have fallen into the 0.5 to 1% range, so if I have to put a number I would say 0.7% with a definite "downside risk" tag attached. The nearest forecast to this that I have seen is the 1% one from the Morgan Stanley GEF team. The implications of such sustained low growth are, I think, important, since if Italy cannot find the way to raise trend growth up towards the 2% mark there is simply no way the government debt can be stabilised and sustained. And with each passing year we have one year less to crunch time. Soft or Hard Landing in Lithuania? 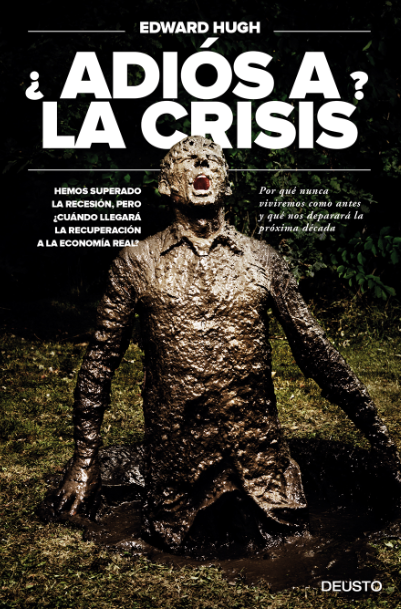 Spains Credit Surge Comes To A Rude Halt?